Best season: April - Nov.
Dolpo is a hidden jewel in alpine western Nepal. Bordering with Tibet and lying west of Kaligandaki valley behind the Dhaulagiri massif, it is a wild, unspoilt and preserved land that offers ancient monasteries, superb alpine beauty and invaluable Buddhist cultural wealth. Open to visitors only since 1989 this area is for the seekers of adventure, authenticity and true wilderness. The two main attraction of a Dolpo trekking are the turquiose Phoksundo lake and the 11th century Shey monastery.It is a strenous trek with a couple of high passes but the rewards are great.The region is famous for the endangered snow leopards, other animals in the region include Blue sheep, Mountain Goat, Jackal and Wolves. Isolated from rest of the country, life in Dolpo has not changed for centuries now. The people follow Tibetan Buddhism and they have some of the oldest Buddhist art treasures in the country. Somepeople here follow pre-Buddhist Bonpo religion. People subsist on farming, yak and sheep keeping and collecting medical herbs. This itinerary covers both lower and upper Dolpo region. The best time to trek here is towards the end of the monsoon i.e. Sept to November. The Dolpo trekking starts with a flight from Nepalgunj to the Juphal airstrip in Dolpa. The trek then passes through sparse villages, wilderness regions and numerous yak pastures.Our first destination would be the pristine Phoksundo lake on lower Dolpo. Our next destination would be the exotic Shey monastery built on 11th century. 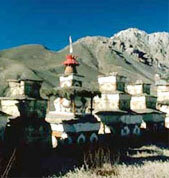 This monastery lies in upper Dolpo. We trek slowly, and acclimatise the high passes carefully and finally emerge at Juphal airstrip to end our trek. We fly to Nepalgunj and then to Kathamndu, where we celebrate our amazing trek with a Nepali dinner and a ethnic cultural show. It is a fully supported camping trek, our sherpas will fix your tents and our camp cook will prepare hot meals for you. During the trek you carry just a light daypack and the average walking hour is 6 hours. Day 07: Hiking and exploration around Phoksundo the lake. This lake is one of the important attraction of Dolpo trekking. Day 25: Rest and shopping .Farewell Nepali dinner with cultural show.